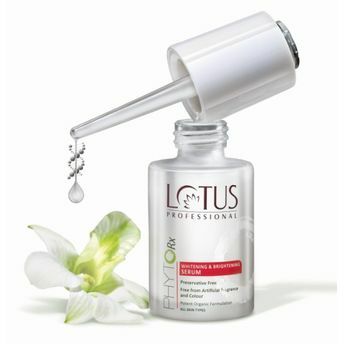 Get glowing skin with Lotus Professional Phyto-Rx Whitening & Brightening Serum. This serum protects your skin from exposure to sun and helps you recover from the loss of natural fairness. This revolutionary tri-action blend of Amla Berry, Lychee and Punarnava Root acts against UVA and UVB induced stress and pigmentation, resulting in a lightened skin tone. Enriched with anti-oxidants that moisturizes and promotes healthy skin. Explore the entire range of Serums & Essence available on Nykaa. Shop more Lotus Herbals products here.You can browse through the complete world of Lotus Herbals Serums & Essence .